It is likely not every day that you get to see one of the oldest organisms on the planet. In a forest that seems to otherwise be no different than the many other beautifully wooded areas of central Pennsylvania, one of the world's oldest living organisms owns the forest floor. The Hoverter and Sholl Box Huckleberry is one of the neatest things that I have stumbled upon in the state's forests. This plot of land is over 9 acres and the forest floor. This obscure colony and species is named Gaylussacia brachycera, and very few of these colonies remain. This particular colony has been estimated to be anywhere from 1000 to 1400 years old. Another nearby colony in Losh Run is estimated to be as old as 10,000 years old, and once spread over a mile, but was largely knocked out when Route 322 was expanded in the 1960s. This species is believed to be a relict of the last ice age. Colony age is estimated by the average rate of root growth in a year of only a few inches, it is easy see how long it would take a colony to grow to be a quarter mile in size. The trail at the Hoverter and Sholl Box Huckleberry Natural Area loops around this box huckleberry colony, with mild elevation change over a quarter mile. It is the smallest area that the state has classified as a natural area, but it protects an absolute treasure. The growth rate of the colony places age estimates at around 1000 years old. The forest floor is dominated by the box huckleberry, which provides an awesome color contrast with the forest floor. It is important to stick to the specified trail, for this species is threatened, with only a small number of them remaining. This is also one of the oldest organisms on the entire planet. In the spring and summer the box huckleberry flowers, and the colony bears fruit in late summer. This forest area is well worth going out of your way to visit. While the box huckleberry is only a few inches off of the ground, its seemingly endless spread across the forest floor is awesome to see. As someone into railroading, almost anything along a rail line sparks my interest to check out. I have always appreciated railroading, largely stemming from my parents taking me to the incredible Strasburg Railroad near Lancaster, and Steamtown in Scranton. As someone who has traveled through Harrisburg for my entire life, I have always been captivated looking out at the Rockville Bridge. This tremendous bridge crosses the Susquehanna River between Rockville, Dauphin County, and Marysville in Perry County, just north of Harrisburg. We highly recommend spending the night at the Bridgeview Bed and Breakfast, which gives a tremendous view of the bridge. The wide and extremely shallow nature of the Susquehanna makes this river stand out from the rest of the state's rivers, with most of the major rivers tending to be thinner and deeper. The Rockville Bridge, the Reading Railroad Bridge, and the Cumberland Railroad Bridge, in addition to the amazing street bridges across the Susquehanna River in this region, have an absurdly large amount of arches/piers. If you stand at the bottom and the end of any of these bridges, they are so large that they almost look as if they are endless. The immensity and unique nature of these bridges make all these sites awesome sights to behold, especially for people who love to see incredible engineering, bridges, and railroads. If you do not have interest in those things, you just may end up doing so after seeing this bridge. The Rockville Bridge is the longest stone masonry arch railroad bridge in the world. The bridge has forty-eight spans that are seventy feet long. The bridge is 3,820 feet long. It was built by the famed Pennsylvania Railroad Company and was integral to helping the allies win in World War I and World War II. The bridge was heavily guarded during these wars, especially after the Pennsylvania Railroad's Horseshoe Curve in Altoona, was nearly the target of a potential sabotage effort by Nazi spies. The bridge had trains on it almost 24-7 through the entire war effort, and even today, the bridge is very heavily used by Norfolk Southern and Amtrak trains. For anyone who loves watching trains, this place is an absolute joy to check out. This visit was particularly special, for the eastbound Amtrak Pennsylvanian train was just passing through after having originated in Pittsburgh and traveled through the station towns of Greensburg, Latrobe, Johnstown, Altoona, Tyrone, Huntingdon, and Lewistown. The bridge is just a few miles from the Harrisburg station, where the train will then journey to other towns, including Lancaster and Philadelphia, en route to its final destination in New York City. As I stated earlier in the article, the immense Rockville Bridge is awesome to check out, especially for rail fans, though I believe that it is impossible to not be impressed with it. 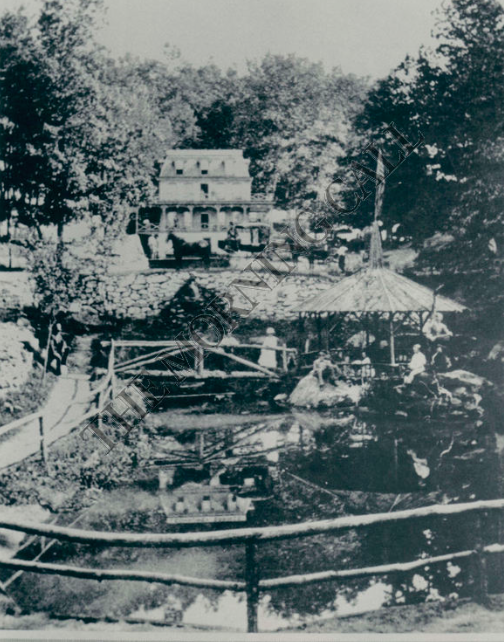 The Fort Hunter Mansion and Park has the clearest publicly accessible views of the bridge, in addition to nice picnic areas, and a center of history from the Revolutionary War times, with other awesome things, including the Everhart Covered Bridge, which dates back to 1881. Very nice place. If you have ever driven through the northern edges of Quakertown along California Road, you may notice some spectacular, root-like sculptures scattered around an otherwise mundane industrial park. These works have been created by Steve Tobin, a world-renowned sculptor, whose work is seen worldwide. His most acclaimed work is the "Trinity Root," a public sculpture created as a memorial to a giant 70 year old sycamore that was smashed when the World Trade Center collapsed on 9/11. The sculpt depicts the stump and roots of that beloved tree, a peaceful and beautiful tribute to that fateful day for the country and the world. That work was moved by the church from the 9/11 site, to their retreat center in Connecticut. It is caught up in a high-profile lawsuit regarding the intentions of an artist when it comes to public works. Tobin's studios serve as an art studio and a foundry. He originally hails from nearby Montgomery County and he graduated from Tulane University with a degree in Theoretical Mathematics. After not finding a career in that field, he took up odd-jobs in museums, which eventually lead him to this. His prowess in math, couples with his artistic sensibilities, and leads towards magnificent creations. He has transformed an otherwise mundane industrial park with his work. Dating back to 1813, Lewistown's Old Stone Arch Bridge is seriously old. No known bridge older than this exists west of it in the entire country. The borough of Lewistown has done something that I wish would happen with all classic bridges that are no longer capable of handling traffic, opening it and the surrounding area up as a public park. Included are benches for reflection and more. This quaint bridge was used for the Harrisburg-Pittsburgh Turnpike, not to be confused with the Pennsylvania Turnpike. It is one of the top 50 oldest bridges in the country, according to bridgehunter.com, having been constructed more than 200 years ago. As I visited, there were people walking their dogs, laying out, picnicking, doing school/office work on laptops, taking photos, and more. It is an excellent place to pull off and relax along the old William Penn Highway corridor in Mifflin County. The bridge was stabilized and rehabilitated in 2006. If you noticed how high the mud line is, you can tell that this area had recently experienced high water conditions. This quaint bridge has a stunning history and is well worth checking out if you are in the area and looking for a place to relax. Lewistown, PA is home to the oldest known structure built by the Pennsylvania Railroad. This quaint building in Mifflin County dates back to 1849 and is located on the old Pennsylvania Railroad Main Line. The line west of Harrisburg now serves as a Norfolk Southern Line, and the line is leased to Amtrak for its daily usage. This section of the line gets two daily passenger trains, with one heading westbound to Huntingdon, Tyrone, Altoona, Johnstown, Greensburg, Latrobe, and ending in Pittsburgh, and the other heading eastbound to Harrisburg, Elizabethtown, Lancaster, Exton, Paoli, Philadelphia, Trenton, and eventually ending in New York City. Historically in regards to the Pennsylvania Railroad, Lewistown was the railroad's gateway to the west. From Lewistown, the railroad would largely follow the route of the old Pennsylvania Main Line Canal west through Pittsburgh. Additionally, Lewistown would serve as a junction point with several other short line railroads. Lewistown is also the closest train stop to State College and Penn State University, located only 30 miles north of the station. This old depot is magnificent and it gives a great glimpse into what railroad stations looked like in small cities along PRR mainline. It is also a labor of love, operated exclusively by volunteers who appreciate the heritage and history of the railroad and region. The station serves as a sort of operating museum, with all sorts of artifacts from the old days of the Pennsylvania Railroad. The Pennsylvania Railroad Technical and Historical Society maintains archives at the old depot. A small railyard is operated adjacent to the station. In my opinion, the most comfortable way to travel is by way of train. Lewistown has the added benefit of offering completely free parking to travelers. Lewistown Station is a special place that you definitely need to check out, especially if you are into railroading. As you drive up the Allegheny River from Pittsburgh, it does not take long to see how wild and scenic the river gets. When you get up to Tionesta in Forest County, one of the small towns located alongside the river, you will see a lighthouse not unlike those you see in places like Coastal Maine. This is an odd thing to see, for while the river is navigable at this point, the lighthouse is not needed for navigational aid. Instead, a group of citizens in the town have created an attraction with one of the few inland lighthouses in the state. Erie and Philadelphia are the only direct port cities in the state. Several of the lighthouses in Erie are considered to be inland lighthouses, meaning they are not considered to be meant for navigational aid. The Turtle Rock Light at Boathouse Row in Philadelphia, while it is pretty much an inland lighthouse, is still considered necessary for navigation. The Sherman Lighthouse is an unusual thing to see within Pennsylvania. The lighthouse is fully operational and it was a dream come true for lighthouse aficionado Jack Sherman. It is now named in his honor as the Sherman Memorial Lighthouse. It has seven floors and is open to the public for three days of the year. The profits from the tours go to the Tionesta Lions Club. This photo shows the sun almost aligned with the lighthouse, making it look as if the sun is the light within the building. The Tionesta Dam impounds a reservoir, which has boat launches, a beach, a campground, general picnic areas, fishing, and hunting opportunities. It also serves as a gateway to the nearby Allegheny National Forest, making this an excellent launching point. The dam was built between 1938 and 1941 as a direct reaction to the devastating St. Patrick's Day flood of 1936 in Pittsburgh. It serves as a flood control barrier and it created a new habitat and recreation area. From here, you can launch further into the beautiful and scenic ride up the Allegheny River and into the Allegheny National Forest. The ride is beautiful all the way up through the Allegheny Reservoir and into the Seneca Nation Indian Reservation in the area of Salamanca, NY. A very scenic and awesome drive. For those of you who love hiking, there are a number of great trails, including the North Country Trail that meanders from New York to North Dakota. Some of my favorite hikes are located along this route, including those in McConnells Mill State Park in PA, the Allegheny National Forest, and Treman State Park in New York. The NCT travels right through here and it is absolutely beautiful. All in all, this is a place that gets our thumbs up. You need to explore it and check it out. This place is filled with adventure. Bethlehem is always a joy to visit, and one of its most vibrant institutions is the Moravian Book Shop. It is the oldest bookstore in North America, and second oldest in the world to Lisbon, Portugal's Bertrand Book Store, though that store has not remained in continuous operation. Moravian Book Shop dates back to 1745, and has continuously operated since that point, making it the world's longest continuously operating book store. It was previously known as the Bethelhemer Bücher Shop and moved to Philadelphia for two years in 1856. The shop returned to Bethlehem in 1858, opened in its current building in 1867. It acquired its current name in 1905. As soon as you walk in, you know you are visiting a special place. It is an inviting place, with lots of great books, nifty gifts, a nice cafe, and a sprawling bookstore that has expanded into a number of adjacent buildings over the years. In addition to books, the store is home to a nice deli, a specialty food store, and the Moravian-Bethlehem Room, which specializes in local and traditionally Moravian items, including Moravian/Advent Stars, 26 point stars that are traditionally hung in windows and on porches. It is located at the heart of the Moravian Historic District, adjacent to the church grounds, Moravian College, the historic Hotel Bethlehem, and the Colonial Industrial Quarter. The shop has an excellent collection of books, a true gem of the community. 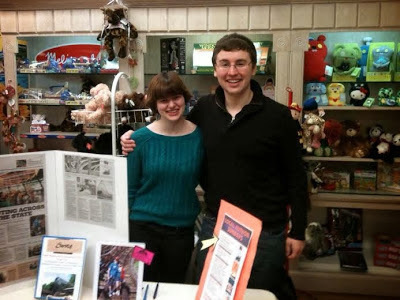 When we first released our book, Great Pennsylvania Amusement Parks Road Trip, the Moravian Book Shop graciously hosted a book signing for us. As soon as you walk into the Moravian Book Shop, it is clear that this is a special place and it is immediately evident why it has remained a staple in Bethlehem for the better part of three centuries. A stroll through the store, and historic downtown Bethlehem, is a must for any history lover. Bethlehem has intact historical institutions, buildings, remnants, and more, that run from colonial times all the way to today. It is a truly special place to visit and we highly recommend it.